Bay Views from Every Window...Love it! Welcome to our beautifully furnished, spacious two-bedroom condo, designed with taste for complete relaxation in mind (over 1200 sq. ft.)! Large windows in every room let in tons of natural light. An electric fireplace in the corner of our living room makes a cozy year-round addition. You’ll find all new, ample seating with a dining table, counter barstools, surround sofa, and plenty of sitting areas for enjoying the view or quiet reading or napping. This beautiful, value-priced condo is located in the quaint and quiet Little Italy area of downtown San Diego and is centrally located; less than one mile (.9) to the Convention Center, 5 minutes by car to San Diego Zoo, walking distance to the Gaslamp District, and Petco Park. Stroll to the nearby waterfront, art galleries, boutiques, restaurants, and nightlife. 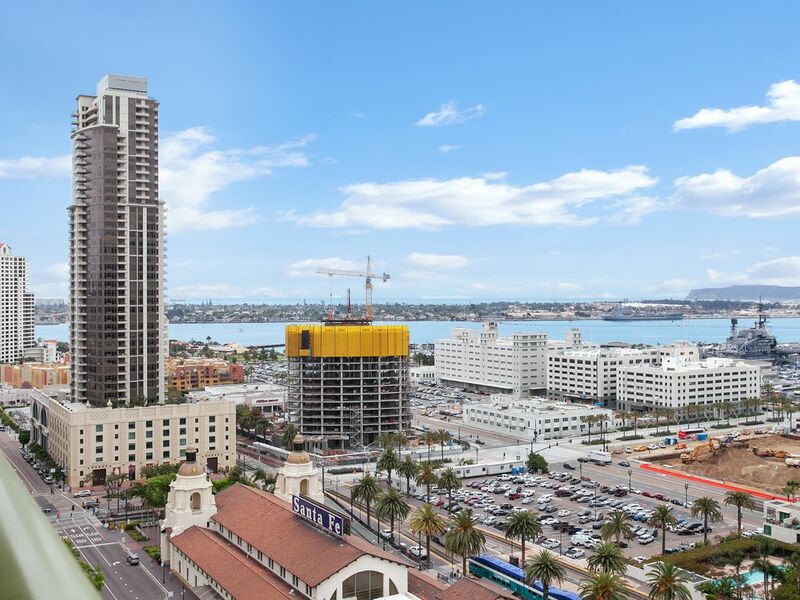 Make plans to visit Sea World, San Diego Bay, Marina District, Seaport Village, Horton Plaza, Symphony Hall and The Embarcadero—which are all easily accessible by walk, bus, train, or car. In addition, the Columbia Street Trolley station is just 3 blocks away, and will take you anywhere you want to go! While dining or relaxing, you can enjoy the fantastic views of the Bay and Little Italy, through expansive picture windows—especially beautiful at night in our cozy living room, complete with large wall mounted, flat-screen TV...perfect for sports fans! OR, enjoy the breathtaking views on our private balcony. The kitchen offers everything you need with stainless steel appliances, dinnerware, silverware (service for 8), and cookware—not to mention the chef's favorite gadgets! And don’t forget your iPod, because we’ve got a Bose docking station to set the mood with your favorite music! For those who wish to have a BBQ, there are stainless propane grills, as well as tables/chairs, in the garden area. The Master bedroom offers a stylish and very comfortable Queen bed with luxurious bedding and wall mounted, flat-screen TV. In addition, the spacious bathroom provides plenty of storage and counter space and is well-stocked with towels. The Guest bedroom provides comfortable sleeping with a Full size luxury futon, and their own private bathroom, also stocked with towels. Hair dryers are furnished in both bathrooms for your convenience. The condo also features a pull-down wall bed—Queen size Serta mattress—for extra comfy sleeping arrangement, as well as a convenient in-unit washer/dryer for any laundry needs. Some of the many amenities offered include a lap Pool, a large roof terrace, a wet bar, a fireplace, a dance floor, a theater, and a barbeque patio. Your workout need not halt while you’re away—burn the calories you consume in Little Italy in the fitness center or the heated, outdoor lap pool, located in the building. All in all, this is one of the best two bedroom vacation rentals in the downtown area. Come and enjoy beautiful San Diego; there's so much to see and do, your calendar can be filled, or you can just relax...it's your choice! We were a lab from Canada traveling down for the Society for Neuroscience conference, and this property was the perfect fit! This apartment faces the bay, giving a gorgeous view both day and night. It is also perfectly located between Little Italy and the Gaslamp Quarter, making it very easy to get around, and with plenty of dining options nearby. Tovik was very helpful and accommodating with our unexpected change of dates. Also, special shout to the San Diego's amazing craft beer and tacos! We definitely hope to be back next year! Chic city sophistication in a beautiful setting! My husband and I live in a rural part of San Diego county and wanted to try living in downtown San Diego for a different experience. So we rented this condo for one month. What a fabulous time we had! The whole experience was great - the condo is beautiful, the view spectacular, and the location superb. We had such a great time just sitting on the terrace watching all the boats, trains, planes and construction. The condo is overlooking Santa Fe train depot, so very convenient for getting around. Although I did much walking just to explore the city. As others have mentioned, Tovik and Colleen couldn't have been nicer or easier to deal with. Very helpful from start to finish. A great place to go in Little Italy that people may not be aware of the Firehouse Museum on Columbia Street. So much to see there, not just fire trucks but everything related to fire fighting over the last 200 years! Don't miss it. Would love to stay here again, or another place run by Tovik. San Diego is a beautiful destination - so much to see and do. Just arrived home from San Diego-- this condo was amazing.. The condo location is perfect. Close to everything . Tovik and Colleen were very helpful and accommondating..We were a party of 4 women visiting relatives and will definitely recommend the unit to others. WATER TURNED OFF ON FINAL DAY OF STAY. TOUGH LUCK. This property is very nice. It is located in a wonderful little community in downtown San Diego. The listing described the condo accurately with one big exception: there was no mention of the planned water shut-off to the building on the last day of our stay. This caused us great inconvenience during our vacation. We informed the owners of this potential problem on our second day and was told "these things happen in strata condominiums". Compensation was offered, but then retracted in the form of a ploy that would require us to rent their condo again in future. Be careful with this vacation rental property. The owners might not disclose some things that reflect negatively on their ability to rent it out. We have filed a formal complaint with HomeAway.com. The property is clean, nicely furnished and apart from the owner's mistake in dealing with the water shut-off situation, we enjoyed staying at this rental property. We are so sorry that you are unsatisfied. We discussed the water shut-off with you on ARRIVAL day, and explained that we also were not aware of the building plans until the same day. When you first learned of the shut-off, you felt it would be a little inconvenient, but did not ask for refund at that time. As a matter of fact, you stated that the accommodations were wonderful! We did not hear from guest for the entire stay, and had no reason to assume that they were not completely satisfied. By the way, the water went off around 6am on the morning of guest departure, and guest left the condo around 7am! Guest was offered 2 nights free on another stay with us. We believe this was the honorable and fair thing to do, as we make every attempt to rectify any issues that arise beyond our control. Our record speaks for itself! My family and I stayed here during Comic Con 2013. The rental is beautiful and spacious and close enough to the convention center to easily get there, but far enough away that it was very quiet and comfortable when we were not enjoying comic con. The kitchen was beautiful and everything you need for cooking meals. The living space was beyond comfortable and large enough for our daily of five to comfortably enjoy. The two bedrooms are comfortable with awesome beds, comfortable mattresses. The two bathrooms were nice sized and the washer and dryer was a must. The parking garage was safe and easy to get in and out of. My wife and I were looking to do something special for our 20th anniversary, yet didn't want to travel a great distance to get somewhere, so we decided to vacation in our own city. We live in a suburb of San Diego, and never really went downtown, so we thought it would be nice to stay downtown and live like the tourists. After looking at some properties that weren't available, Tovik offered an alternate he had that was a little bigger than we were looking for, but perfect for our getaway, so we took it. We were not disappointed. This place is wonderful and gave us the upscale getaway we were looking for. Rooms were spacious, the 20th floor balcony gave us the view and background sounds of planes, trains, automobiles and boats. We could experience the energy of the city, and when we didn't want to hear the sounds of the city, everything was blocked out by closing the patio door. We didn't even want to leave the room, but also didn't want to cook. We were just two blocksfrom Little Italy for restaurants and farmers market on Saturday morning. Then in the opposite direction, we walked along the harbor through Seaport Village, Horton Plaza, and the Gas Lamp area (more awesome restaurants and we took a pedicab home only because we hadn't done it before). Driving to the museums and zoo in Balboa Park was less than 5 minutes. What made the whole experience even better was the warmth and hospitality of the owners Tovik and Colleen. He was in the hotel management business for years, and it shows with how well he took care of us and his responsiveness to questions. We rate this place with four thumbs up and will contact Tovik again to see what other properties he has we could stay in the next time we want to "visit" San Diego. $500 Security Deposit (refundable) required at time of booking with signed Contract $25 per person, per night over 4 persons (for less than 30 days) 10% Service Fee under 30 days PayPal available for credit card use; 3.2% US/4.2% Int'l. surcharge applies CANCELLATION: Lessee may cancel without charge up to 60 days prior to occupancy. If cancellation is less than 60 days, Lessor will use its best efforts to rent the unit for the same period. If unit cannot be rented for said period, the full rental amount will be used to offset any lost rent, however, full credit will be given for future stay based on space availability within a 12-month period.